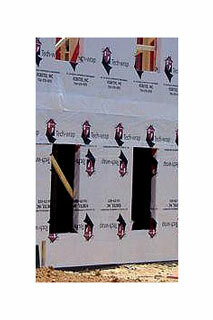 PRODUCT: TECH-WRAP HOME WRAP, POLYPROPYLENE HOUSEWRAP AND AIR/MOISTURE BARRIER. 9 x 150' ROLL (13.5 SQ). PRICE/ ROLL. Residential House Wrap for vapor and moisture protection. Tested and complies with the Uniform Codes, the BOCA National Codes, ESR Codes and the SBCCI Standard building Codes. Water Resistance: 15 min @ 27 Pa/ 15mph. Passed.